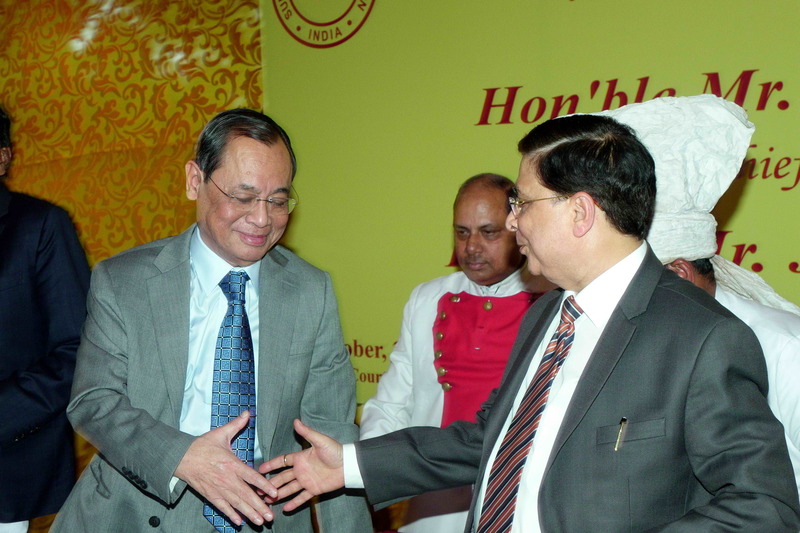 Tomorrow Justice Ranjan Gogoi will be taking oath as the 46th Chief Justice of the Supreme Court of India and as the first Chief Justice from the State of Assam. Being the head of judicial family of the country, a series of challenges await the new Chief Justice. The approach that will be adopted by Justice Gogoi in addressing these major challenges will be keenly observed. The first challenge certainly will be the issue of “Master of the Roster”. While all the judges of the Supreme Court are considered equal, the Chief Justice is the ‘Master of the Roster’ as has been indicated by successive judgments, some of late passed by Justice Dipak Misra himself. It will be a challenge for the new Chief as to how he conducts himself in terms of his new role as ‘Master of the Roster’. It may be recalled that Justice Gogoi himself was one of the four senior judges who went before the nation indicating that all is not well regarding the usage of this authority i.e., of ‘Master of the Roster’. Now it is his turn to use the same authority. That perhaps will be the foremost challenge and equally the biggest expectation from his reign. The second major challenge before the newly appointed Chief Justice would be to deal with the issue of large pendency of cases which are at every stage of our judicial hierarchy. Justice Gogoi himself, while addressing a gathering recently, had flagged this issue by saying that pendency of cases is bringing “disrepute” to our system. He has also indicated that he as a plan to deal with the pendency of cases and would be unfolding it soon. The third major issue before the Chief Justice Gogoi would be the issue of appointment of Judges and the finalization of Memorandum of Procedure [MoP] for the same. In 2015, a Constitution Bench of the Supreme Court had directed the Government to draft a new MoP for appointment of High Court and Supreme Court Judges, which is still not been finalized. The Govt. and the Supreme Court often have been at loggerheads over this issue. This issue remained unresolved during the tenure of Justice Misra and the same was reflected by intermittent appointments. Now with Justice Gogoi at the helm, all eyes are on him to see as to how he will resolve this issue with the Govt. Fourthly, Justice Gogoi is currently presiding over the bench dealing with the updation of the National Register of Citizens for the State of Assam alongside Justice Rohinton Nariman. While Justice Gogoi has been keenly overlooking the entire batch of matters and connected issues, it is yet to be seen, whether Justice Gogoi will continue dealing with the NRC cases or may entrust the same to another bench due to his becoming the CJI. Lastly, reconstitution of the benches presided over by Justice Mishra hearing important matters will also attract attention. A bench of Chief Justice Dipak Misra, Justice Ashok Bhusan and Justice Abdul Nazeer, on 27th September 2018, have done away with the question of referring the judgment of Ismail Farouqi to a larger bench and while refusing reference, the Court directed the appeals to be listed for hearing in the week commencing from October 29th 2018. Since Justice Misra himself, was part of the bench hearing the BM-RJB dispute so reconstitution of this bench is inevitable. Whether the new CJI will himself preside this bench like Justice Mishra or not? And whether there will be other changes in the bench currently dealing with this matter? Therefore, many such challenges await the new CJI. The answers to them will be clear in the coming days. Fuzail Ahmad Ayyubi is an Advocate on Record at Supreme Court of India.